In this study of ACTS, groups will discuss the successes and failures of the New Testament church and will encourage the same power in today's local church. 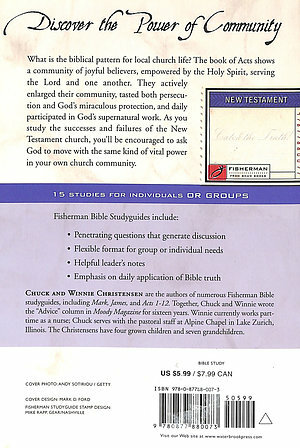 In the chapter by chapter study, Luke, the author of Acts, lays down the pattern for the local church life; a community of joyful believers; em powered by the Spirit; serving the Lord and one another; actively enlarging the fellowship; tasting both persecution and God's protection; and participating in His supernatural work. Includes Leader's Notes. 15 studies for individuals or groups. Acts 1-12: God Moves in the Early Church by C. Christensen;W. Christensen was published by Waterbrook Multnomah in January 1993 and is our 30823rd best seller. The ISBN for Acts 1-12: God Moves in the Early Church is 9780877880073. Be the first to review Acts 1-12: God Moves in the Early Church! Got a question? No problem! Just click here to ask us about Acts 1-12: God Moves in the Early Church.